You don’t have to wear one of those tacky “Hello, My Name Is” stickers on your shirt after you sign on, but eBay does need to know some things about you before it grants you membership. You and millions of other folks will be roaming around eBay’s online treasure trove; eBay needs to know who’s who. So, keeping that in mind, sign in, please! If you’re having a momentary brain cramp and you’ve forgotten your age — but if you can remember reading Harry Potter books right after the first movie of the series came out, or seeing Star Wars Episode 2: Attack of the Clones in the theater, or wearing out a VHS tape of the original Toy Story while growing up, you’re in. Head to the eBay home page and register. The entire process takes only a few minutes. Before you can sign up for some fun on eBay, you have to be connected to the World Wide Web. This is the time to fire up your computer and connect to the Internet. After you open your Internet browser, you’re ready to sign up. Go to the eBay home page. Right there, in the upper-left corner, is the Register link (look for a button or link indicating Register somewhere on the page). Click the word Register and let the sign-up process begin. 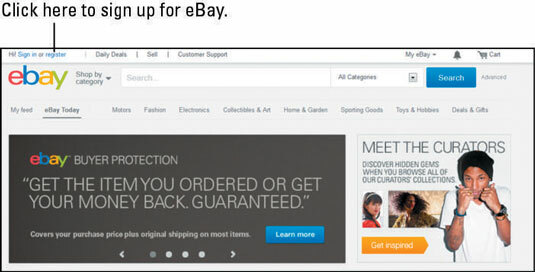 The eBay home page changes all the time. If you don’t see a Register button, look around the page — a Register button or link will be there somewhere. Breeze through (or past) any optional information. Thanks to a bunch of really smart tech types, you access the Registration pages securely, through an SSL (Secure Sockets Layer) encrypted connection to eBay. You can tell you’re on an SSL connection because the normal http at the beginning of the web address (also called the URL) is now https. The more precautions eBay (and you) take, the harder it is for some hypercaffeinated high-school kid to get into your files. When you’re at the Registration form, you go through a four-step process.